Two Sundays ago, Bryan posted this photo and complained about all the ACC logos visible therein. This led to a lengthy back-and-forth in the comments section about logo creep — mostly about swooshes and other maker’s marks, not about conference logos. The discussion, which I did not take part in (I was at a bar watching football and caught up on the comments later), featured several arguments and analogies that I hear again and again regarding logo creep — arguments that are, frankly, way off-base. Some similar arguments came up yesterday regarding Michael Jordan’s taped-over Adidas logo. As you all know, I hate logo creep and see it as a symptom of a much bigger problem (i.e., the encroachment of advertising into public space). I know some of you feel differently, and I also know that to a certain extent this is generational: I grew up in an era when there were no manufacturer’s logos on uniforms; many of you have grown up in an era when such logos are ubiquitous. But even if we disagree on whether logo creep is a problem, we can at least try to keep the debate on a logical plane and not make straw man arguments or apples/oranges comparisons. With that in mind, I’m going to try to address many of the arguments that came up two Sundays ago, along with some other arguments I frequently hear. I know some of you are tired of this topic, but you’ll have to deal with it for one more day — I wanted to get all my thoughts on the matter in one place, and that place is here. Let’s start with a simple premise that I think everyone here can agree with: Uniforms are special. They serve as the primary bond between fan and team. Players come and go, yet we keep rooting for (or against) that uniform, no matter who wears it. Jerry Seinfeld described this as “rooting for laundry”; I go further and say it’s a unique form of brand loyalty. Elsewhere on the consumer landscape, your loyalty to a brand is at least somewhat dependant on the content and quality of that brand — it has to taste good, or function well, or whatever. If the content changes, your loyalty will probably change too (that’s what the Coke execs learned with the New Coke debacle). But with sports, the content of a team, and the quality of that content, is changing all the time, yet we remain loyal to that logo, those colors, that uniform. Just to make the point in a more specific way: Everyone here knows that I love the Mets and hate the Yankees. But if those two rosters were traded for each other today — straight up, 25 guys for 25 guys — who would I root for tomorrow? It’s a no-brainer: I’d root for the guys wearing the Mets uniforms, even if I hated them the day before. That, my friends, is a very special and unique bond. And that’s ultimately why most of us are here at this site to begin with. Look, of course companies are gonna put their logos on the uniforms they make. Duh, it’s called marketing. Yes, we all know it’s called marketing. The question isn’t about why they do it; the question is whether there are some places — like, say, on a uniform — where marketing is inappropriate. But it is appropriate on a uniform. It makes sense for a company to put its logo on the clothing it makes. They’d be stupid not to do it. Take a look at your feet right now. Unless you’re wearing sneakers, I’m willing to bet that there are no logos on your footwear. There are probably no visible logos on your shirt or sweater, either. If you’re wearing a tie, there’s almost certainly no visible logo on that. Are the manufacturers of those products stupid? More to the point, look at any pre-1990 major-level sports photo. You won’t see any manufacturers’ logos there, either. Were Spalding, Wilson, and Rawlings all stupid for decades, and then they suddenly wised up in the 1990s? Or did the sportswear industry decide to push the boundaries to see how much advertising they could push into the public eye? While we’re at it, let’s look at some non-sports uniforms, like the ones being worn by UPS deliverymen, cops, airline pilots, or Burger King employees. 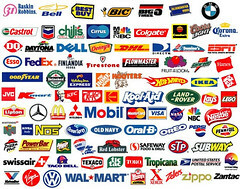 See any manufacturers’ logos on any of those? Look, a sports uniform is a logo, and it already stands for a brand — the brand of the team that wears it. The uni manufacturer is simply a vendor providing a product to a client. The client (i.e., the team) is what’s important, not the vendor. Here’s another way to look at it: Some company made the buttons on the uniform, and another company made the zippers, and some mill made the fabric, and another mill made the thread, and some sewing shop stitched all the components together. But you don’t see all their logos on the uniform, right? Of course not — what matters is the end-product brand, not all the little sub-contracted components. And in the case of a uniform, the end-product brand is the team. Saying that the Reebok logo shouldn’t appear on, say, the Cowboys’ football uniform is like saying a car company shouldn’t put its logo on a car that it makes. Getting back to the car analogy: What if the steel mill that produced the steel for the Focus insisted that its logo be visible on all of the car’s doors? And what if the manufacturer of every other component of the car did the same? That’s the proper analogy — that would be the automotive equivalent of logo creep. But of course those companies don’t put their logos all over a car, nor would it be appropriate for them to do so. Wait a minute, my car has Firestone tires and AC sparkplugs, and those logos are visible. But those are items that you, the driver, can switch out and replace with other brands — they’re more akin to a fielder’s glove or a goalie’s pads. They’re equipment, which can be purchased from a variety of sources, not part of the car’s “uniform.” I’ve never had a problem with logos on equipment, because equipment is a matter of personal choice, not team uniformity. OK, maybe you have a point when a company is just the latest manufacturer to produce an old, pre-existing design. But in a lot of cases, the sportswear companies are actually creating the designs we see on the field. Why shouldn’t they take credit for that in a visible way? Do you know who designed the chair you’re sitting in right now? Or the building where that chair is situated? Or any of the hundreds of objects with which you interact on a daily basis? For better or worse, designers in our culture generally don’t get to sign their work — they, like the manufacturers they work for, are simply vendors supplying a service for a client. Even if you think designers should get visible credit (an argument that I agree has some merit, but one that we’ll save for another day), that doesn’t really change the parameters of the logo creep debate as it applies to uniforms. Small example: Todd Radom designed the Anaheim Angels’ uniforms — so should his logo or initials be on the sleeve? I think most of us (maybe even Todd) would agree that the answer is no. And if that’s the case, then why should a uniform designed by Nike carry a swoosh? Look, sports is all about business now, so logo creep is just part of the deal. Romantic nostalgia aside, sports has always been a business. You think Walter O’Malley wasn’t a businessman? Or Calvin Griffith? Or Charles Comiskey? In fact, the team owners from that era were arguably more revenue-obsessed than today’s owners, because most of them had no other business holdings besides their teams, while many of today’s owners got wealthy in other industries and then bought a team as a vanity project. So while the dollar amounts may be bigger today, it’s not as though sports has suddenly morphed into a business after spending generations functioning as something else. Anyway, the “It’s just business” argument misses the larger point: Yes, sports teams are business entities, but I would argue, strongly, that they’re also civic entities — that’s why we care about them so much! They carry the name of our cities and states, we rally around them, we live and die with them. Moreover, most of them have gotten big tax breaks and/or play in facilities that were built with public money, and many college and most high school teams represent public scholastic institutions, so the public has a stake in their behavior — a stake that goes beyond the bottom line of the accounting ledger. In short: I don’t want to see my team, in which I have a huge emotional investment, selling out part of its uniform to an advertiser. These teams already make tons of money — there’s a big difference between business and greed. How can you tell a team, or a league, or anyone else, not to capitalize on a potential revenue stream? That’s just common sense, plus it’s the American way. Just because you can sell something, that doesn’t mean you should sell it. You could make a lot of money selling a kidney, putting your family’s heirloom silverware up for auction on eBay, or pimping out your sister, but that doesn’t mean any of those things is a good idea. There are certain things that we, as a society, have said are not for sale. Remember the outcry when MLB wanted to put Spider-Man 2 ads on the bases a few years back? Personally, I see little difference between that and a swoosh on a uniform sleeve, although I realize many fans don’t see those as comparable examples. In the larger sense, the “It’s just business” argument essentially boils down every human interaction to its economic value, which is both reductive and offensive. The things we value most highly — love, faith, art, genius, charity, friendship, family, nature, community, etc. — all transcend monetary issues. In fact, that’s a big part of why we value them so highly. I believe the fan/team relationship, as symbolized by the uniform, should fall into that category too. As for the “American way” argument, putting ad logos on uniforms is actually the European way. We’ve mostly avoided that here in America, except for manufacturer’s marks. I wish we could avoid those, too. Well, good for you, Mr. Holier Than Thou, but the horse is already out of the barn. Look around you — you’ve lost the argument. Logo creep is everywhere in sports. Give it up already! First of all, it’s not everywhere. There are no manufacturer’s logos on NBA uniforms (to David Stern’s everlasting credit), or on college basketball jerseys, or on MLB caps, or on socks in any of the four major pro leagues, and I want to make sure those situations stay that way. Moreover, I want to raise awareness about the encroachment of advertising in places where I don’t think it belongs. Even if it’s too late to keep the Majestic logo off of a baseball uniform, I hope it’s not too late to make sure a MasterCard sleeve patch never appears there. And it’s never too late to make people think a bit harder about what they see during a sporting event — that’s what Uni Watch is all about. Well, it’s fine for you to say a team shouldn’t maximize its revenue. But Nike gives college athletic departments a lot of money in return for all those swooshes, and that money goes a long way toward helping all sorts of student athletes. If they turn down that money, how are you gonna replace it? Are you gonna write a big check yourself? I’m not going to get into a long discussion over the cesspool of money that characterizes so much of college sports, but the above-stated argument makes two major suppositions: (1) Major funding for college athletics is an entitlement, and (2) the athletic department is essentially for sale to the highest bidder. I reject both of these notions. But for the sake of argument, let’s go along with the idea that big money for college athletics is a good thing. Now, we both know that Nike isn’t giving out all that money from the goodness of their hearts — they’re doing it because they think they’ll get a good return on that investment, which means it’s essentially dirty money. By way of analogy, let’s say American Express offered to give the state of Illinois a huge sum of money targeted for the state’s school system — but in return, the AmEx logo would have to be printed on the statehouse dome, AmEx ads would have to be posted throughout state facilities, and the state itself would have to be renamed “American Express Presents Illinois.” Would that be a good idea? Not to me, no matter how much money they were offering. And if you think that hypothetical example is ridiculous, ask yourself how ridiculous “the Tostitos Fiesta Bowl” and “the FedEx Orange Bowl” would have sounded 15 years ago. I’m sick of all this corporate-bashing — you just hate brands and products and capitalism and consumerism. If you knew anything about my pre-Uni Watch writing, you’d know that I’m fascinated by consumer culture. Hell, I have an iconic product tattooed on my right arm. Again, my problem isn’t with consumerism per se — it’s with consumerism run amok. We may all have different ideas of what “run amok” means, but to me it means, among other things, a Nike logo on a uniform sleeve. And it certainly means MJ having to tape over the Adidas logo on his practice jersey. You’re such a hypocrite. If you hate logos so much, why do you slap the Uni Watch logo on T-shirts, coffee mugs, and lots of other merchandise? Yes, I put my logo on T-shirts, just like the Mets put their logo on T-shirts, and Nike puts a giant swoosh on T-shirts. I have no problem with any of that — I just don’t want a swoosh and a Mets logo together on the same shirt, because they have nothing to do with each other. I’m not taking issue with marketing per se — my gripe is about marketing in inappropriate places, like on a uniform. Yeah, but you’re still a big phony, because the Google logo appears all over the Uni Watch home page. Now there’s some logo creep! Actually, quite a few logos appear on the Uni Watch home page. That’s advertising for ya. Publications and web sites are traditional and appropriate places for ads to appear — that’s how publications and web sites stay in business (especially web sites, since most of them — including this one — give away their content for free, as opposed to most publications, which have a cover price). One more time: I’m not opposed to advertising and marketing per se — I’m simply opposed to them in places where I feel they don’t belong. I think a team’s uniform is one of those places. You know, I don’t necessarily disagree with you, but I’m sick of hearing about it. I love sports, I love uniforms, and I want to enjoy them without thinking too hard about any of this stuff. I’m actually more sympathetic to this point of view than you might expect. I think we all have areas where we’d rather have blinders on and ignore troubling information because it gets in the way of our enjoyment. Case in point: I love animals, but I also love eating meat. When I hear vegetarians talking about the deplorable conditions in cattle feedlots and such, I tend to tune it out — not because I think they’re wrong, but because I want to keep enjoying my steak without wrestling too hard with any ethical and moral implications. This is, as Al Gore puts it, an inconvenient truth. So I understand that I may come across as a crank regarding this issue. And really, I’m not trying to ruin your good time — it’s just something I happen to feel strongly about. And that feeling comes from the same place as the rest of Uni Watch. Thanks for listening. From now on, when logo creep discussions break out in the comments section, I’ll just refer people to this page. Phil here. Was that a great article or what? I hope you all enjoyed this first installment of “Best of Uni Watch”. I’m sure a lot of you fine readers hadn’t seen that one before, but it surely is as good and poignant (maybe even more so) now as it was back in 2007. Feel free to fire away in the comments as if it were brand new material. 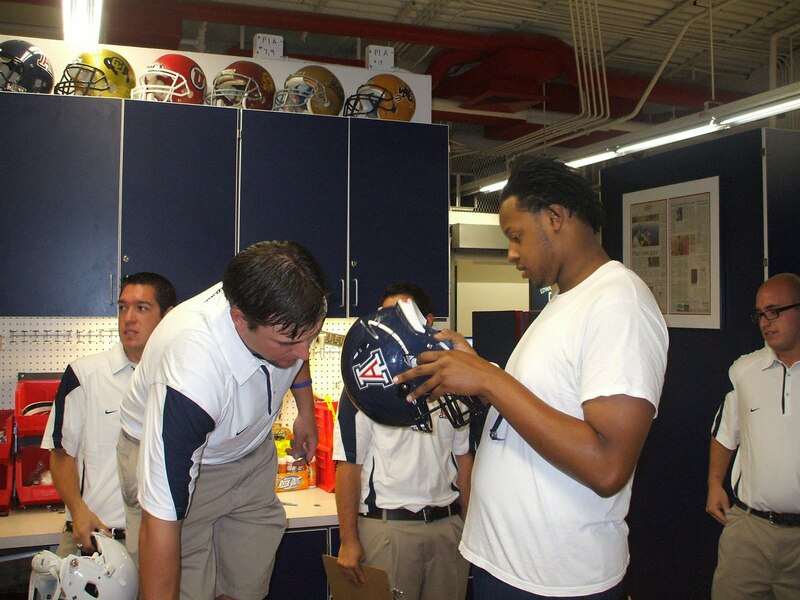 … Bill Sour was looking through the photos on that Arizona Wildcats equipment blog and noticed in a few of the photos, including one that show helmets for the other schools in their conference up on top of the cabinets. If you look closely you can see lids for the two newest members of the conference, Colorado and Utah. It appears the Wildcats are already looking forward to having some new opponents in the Pacific. … Mary Lynn Delfino found an article which reports that Toledo, who plays in the MAC, is the only Under Armour football team in the Midwest. … “Looks like one of your readers has a sense of humor,” says Stan Olechowski, who stumbled upon the Uni Watch EA Team Builder football squad. Didn’t someone try to create a whole team based on UW “members”? Is Jim Vilk the designated soccer-style kicker?… “Was this card really issued?” asks Jon Alvani. That picture comes from this website. … Great spot by Samantha Skolnick, who noticed Cy Lincecum started the night “Breathing Ethier” at the end of the second inning. But then in the third inning he changed and “is now advertising the devil company.” … Mike Raymer sent along this link that talks a little about the new Georgia State University uni’s. “As you know,” he adds, “this is the first year for the team.” … Outstanding find from Jeff Anderson, who learned that IU had worn blue uniforms for a short time in the late 50’s. Here is the story behind the jersey. And here is a photo of the jersey. … Good article in the NYT about testing new girdles that have built-in padding at the hip, thigh and tailbone (thanks to Uni Watch Prexy Paul Lukas; also noted by Christopher Leopardi and Alan Tompas) … West Coast Correspondent Brinke Guthrie asks, “Is it just me, or does this guy look like a typo?” … Hard luck pitcher Roy Oswalt lost his first decision as a Phillie while wearing pajamas, so last night he went with a more appropriate look, and got the ND. Of course, Bob Davidson absolutely screwed the Marlins in the bottom of the 9th, giving the Phillies a second chance and the win in the 10th. … “Was watching an AFL documentary called Rebels With a Cause today and they showed some footage of an unnamed team practicing with a player wearing number 1 1/4,” says Jonee Eisen. “I’m wondering if that’s a clever way of distinguishing the quarterback.” … Joshua Kramer noticed that this years batch of Authentic jerseys have a different “1” on them than last year’s jersey’s. Here is Percy Harvin’s jersey for sale on the official Vikings shop page compared to Harvin holding up his with Chilly after the draft. Joshua feels this new “1” looks out of place next to the “2” with that abrupt sharp edge. … From the “he’s still playing?” deparment: Get Your Shaq Celts jersey — or, not. Thanks for a great first week putting up with me, everyone. You guys are the best. Everyone have a fantastic weekend and enjoy some great new stuff from Ek as he fills the weekend spot. See you on Monday with some brand new stuff. actually the zippers do have logos on them..
how do you feel about adidas’ “three stripes” concept. maybe they dont have the a wordmark, but they integrate three stripes into their designs? Overall, I like the Adidas 3 stripes, I’m not really a fan of the current set, where the stripes start and stop. Love the new news ticker images! That’s my uni on the Teambuilder. It was actually quite fun to do, trying to make it something Paul would like. And no, I didn’t make everyone into a player. That must’ve been someone else. Dan King, you’re my hero of the day. That’s an awesome uni design. Most big-name newspaper columnists have one or two columns that they either reprint every year or two (David Broder, for ex), or that they lightly rewrite and pass off as “new” every year or two (George Will, for ex). They do this because they’re lazy. Paul should rerun this column every year or so, but he should do it because it’s awesome. 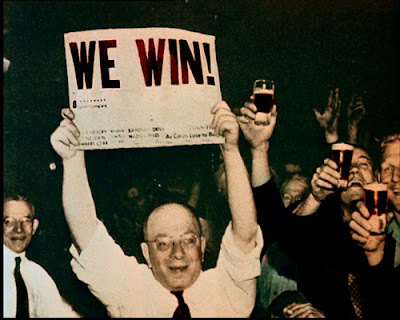 I’ve often wondered about the Cheers “We Win” newspaper headline. Such a terrific picture. As Cheers was set in Boston, my first thought was always Red Sox, but the picture didn’t look like it was taken in 1918 or prior, and I don’t know whether newspapers ever used font that size in headlines back then. My best guess would have been the end of WW II. But the headline is actually (according to an IMDB poster) from 1933. Thank you, RS (and Phil), for the kind words about this piece. Glad it still resonates! To an extent I agree with the awfulness of excessive logo creep, but there is a tangible and emotional benefit of having a manufacturer logo on a uniform…replicas. Consumerism and fanaticism go hand in hand. Die hard fans want to know they are buying an “authentic” replica jersey or team apparel. They want the same Nike, Adidas, et al. garment their heroes are wearing. They don’t want some Bobo-Brand, knockoff version…they want the real thing. A logo helps insure that. I don’t disagree but you can get the same effect from a logo that’s not visible – inside the authentic, for example. New Era 5950’s do just fine as authentics without having a visible log. The last authentic I bought was an EPL jersey – there’s a large Nike logo on the outside and an IMMENSE Nike tag on the inside. The latter tells me its authentic, the former tells everyone else its a Nike. >Consumerism and fanaticism go hand in hand. Maybe for you, but not for everyone. You’d be hard-pressed to find a bigger Mets fan than me, but I own almost no Mets merch. Just not my thing. The idea that you need a closet full of jerseys (or caps, or whatever) to be a good fan is ridiculous on its face. I’d argue that consumption and fanaticism go hand in hand, but consumption in sports takes many non-commercial forms. Used to be we consumed stats and information as well as the games. We studied the back of baseball cards and argued about how Robin Yount would hit against Dwight Gooden. We read newspaper articles and clipped bits from programs. Then sports leagues have found a way to funnel much of that consumption into consumerism. And then, of course, the Internet took all these forms and expanded them exponentially. My dad is a big mets fan too, the only Mets merch I know that he owns is a sweatshirt from 1986. I get what you’re saying, but I think the logic and emotions of this kind of fanaticism lead to the opposite conclusion. The true obsessed-with-authenticity fanatic should prefer the un-logo’d original, because then the authenticity of the jersey on his back reflects actual knowledge and effort on his part, not merely the ability to differentiate between an embroidered or an iron-on logo on a sleeve. There are all kinds of details aside from the manufacturer logo that mark the authentic jersey from the replica, in all sports, and the true jersey fanatic can spot at least three of them on any jersey at four yards. Logo creep devalues that kind of fan expertise. Hey LIPhil, as Mr. Peterman told Elaine on Seinfeld after returning from his hiatus in Myanmar, “Congratulations on a job…. done.” ;-) Just kidding…. great job this week. The columns were chock full o’ goodness. As Phil (commenter above) mentioned, great news ticker image. Gotta love Gomez! I regret the one chance I had to meet him and didn’t take advantage. I was in Chicago at a nearly empty mall and was going down an escalator. I saw him sit down at a nearby bench (he was in town appearing in a theater production). I could have gone back and and chatted with him, but had to get back to work. Dang it! Its not a very detailed image…but that Emirates uniform doesn’t look so bad. Green, black, red and white looks pretty good ( think original NJ Devils ). I always though the Wolverine helmets wings and stripes were stuck on like decals… Interesting to find out that they are mask-stenciled and painted in. 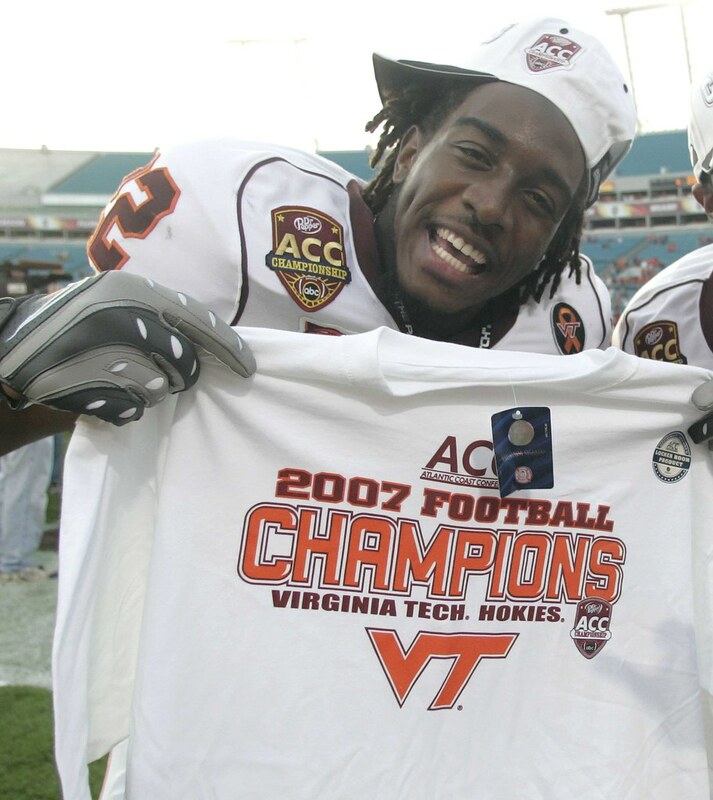 My biggest gripe with current college football jersey designs (you have Virginia Tech to lead off the article, and they are a good example) is that the company logo often has a larger footprint than the school name/symbol. Aside from the ACC championship jersey, the MAIN logo you see on the jersey is the Nike swoosh, with a much smaller VT on the neckline. It should most definitely be the other way around. And no maker’s marks on the unis to boot. The ALL-GEOGRAPHIC, TOPOGRAPHIC or METEOROLOGICAL Team. Steve Nebraska (yes, that’s a movie character…but it IS a sports movie so let’s say they’re okay). (Piss On Everything Tomorrow’s Saturday). Finally found an online picture of a local business that has a rather funny misuse of a famous logo. (It’s a business I drive by on the way to/from work.) I distinctly remember a heated discussion about this logo with a friend in 1972. How could I have forgotten the immortal Larry Canada? Sorry, Phil; points deduction for quoting Chris Berman. my bad (missed Cliff Lee above). Bill France Sr. and Jr. I think the best argument about logo creep is this: The team already has tons of advertising thru out the stadium, which is fun since theres alsways beens ads in stadiums, so why do they need to plaster that on their uniforms? Hell take majestic, seeing the Majestic – Authentic MLB Jersyes ad in a stadium sells them more than that little majetic logo on the uniform! and i pray to god the teams never get like europe. I see…the manufacturer logos never bothered you until Paul told you that they should bother you. Doesn’t that Vikings replica jersey seem to be missing all its piping/bumper stickers? Not sure if that is accurate, but if they shed that stuff it would be a HUGE improvement. Alright, looked around at some more images and the piping/bumper stickers are definitely still there. This picture does however show what a huge improvement it is for their jerseys to just remove the unnecessary junk from the jersey. This has always been one of my favorite entries. It’s one that I e-mailed to almost everyone I know. Thanks for bringing it back, LI Phil. Good call. Interesting story about the Hoosiers blue jerseys and Woody Hayes. That Indiana board has some good historical information and pictures. Looks like the MLS club Real Salt Lake will be unveiling a 3rd kit soon. Remember when Paul said that he had attended a European advertising convention, and a hockey game broke out? The image is probably no longer available. Not the same image, but I think it’s the same game. Then again, how could one tell? National Advertising Symbols Cluttered for Awareness and Recognition Hockey League. Look closely at the article about the Georgia State football uniforms. This is the 1st year, if I read that right. They are playing where? From the looks of it, at the Georgia Dome. But there is one key bit in that picture. If it is true, Georgia State is wearing WHITE at home, and Blue on the road. Something to keep an eye on. My problem with manufacturers is that they have succeeded in convincing us that merchandise isn’t good unless it has a certain company logo on it. Someone could be wearing a college football jersey with a Nike logo, and people would think it was pretty awesome. They could be wearing the same exact jersey without the Nike logo, and some people would think it was a cheap Wal-Mart knockoff. It has just…it’s gotten to a point where, as consumers, we are starting to value the logo of the manufacturer more than the quality of the item. Dan, Nice find on the Michigan helmet clip. And funny how they do that in Ohio. That 74 year old guy is amazing does the wing by hand. And I love this idea. Way to think outside the box…I mean…dome. 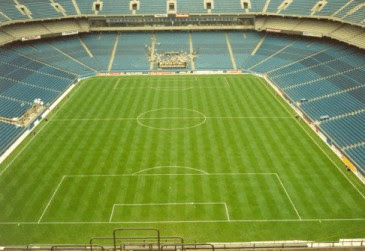 I sat in the upper deck of the Silverdome once, back in 1986. Think I only paid about nine bucks for a Lions ticket. There’s plenty of room to turn that into the lower bowl of a soccer stadium. I wonder if they’d be able to do multiple events at the same time. If so, they could get an indoor soccer team and be the first venue to host an indoor and outdoor game together. Neat idea – the biggest problem I see is that the front rows of the upper deck will be REALLY far back from the touch lines. They could probably fit two soccer fields into that space sideways. On August 19th, the River city Rascals ( http://www.rivercityrascals.com/ ) will have a “Salute to Bill Veeck and St. Louis Baseball History Night.” To honor Bill Veeck, they have signed a little person who stands less than 4′ tall who will wear a jersey with the number “1/8th” on it to honor Eddie Gaedel’s one and only at-bat for the St Louis Browns. I hope to be able to make this game and take pictures. Could the “Logo Creep” article be any whinier? I am all for purity, tradition, and I get on board with the constant complaining about stirrups and pajama pants. But the US sports leagues are grossly behind the rest of the world in marketing of uniforms. The answer to the financial problems that every team in North American professional sports is having (except the Lakers, Cowboys, and Yankees) is not less logos. It’s more. Every one of Mikey’s overt and implicit assertions of fact is false. American sports leagues are more profitable than their European counterparts, and the revenue gaps between richest and poorest are smaller in America than in Europe. And, oh, by the way, in North America, the leagues with less uniform advertising are financially healthier than those with the most advertising. Well lets see. You are the one making the assumptions. Both of you. Never said there wasn’t financial trouble with European or World league in any sport. To say that anything implied in my post was false just proves my point. Wah, Wah Wah, there’s a nike logo on my jersey. The only “healthy” professional sports league in North America is the NFL which is ruled by a superior ownership class that will again clamp down on their workers in the impending lockout. The lockout in the NBA that is sure to come, will only be worthwhile if the ownership groups take over the salary and contract structure like the NHL did. The NHL made the best move out of all the leagues with the restructuring of the NHL with only one issue. It cost them a Television Contract. You can wax poetic about the glory days of unis all you want, I do to. But to whine about what is genuine progress towards financial viability in the pantheon of sports just makes you sound out of touch. The fact that if leagues offered 2 year sponsorship deals to corporations, it would only sell more apparel. It would only be to the benefit of all teams. The key words being “all teams” in that statement. perhaps lower salaries might help some…is there ANY reason ANY athlete should be paid $27 million a year? 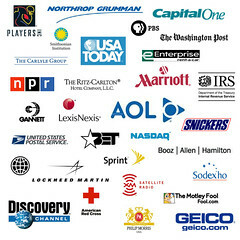 despite what they may “generate” for the owners…i don’t begrudge labor for getting what the market will bear, but maybe if the owners didn’t have to fork over these obscene salaries, they wouldn’t NEED the ad revenue to cover those salaries…and every piece of outfield wall, basketball court, hockey boards or soccer jersey wouldn’t need to be covered with ads? Supply and demand cause the price of tickets, not the salaries of the players. if that were true, why are there empty seats? This is correct. The teams will only charge what the market will bear, regardless of what the players are paid. The teams have myriad revenue streams, ticket revenue being just one of them. It would be foolish for teams not to charge as much as they think they can, from a business standpoint. As to Phil’s question about the empty seats: there could be any number of reasons why even a good team has some empty seats. In many cities, especially places like LA, NYC, CHI, MIA, any of the large media markets, there are plenty of things to do in the summer besides go to a baseball game. There are many ways to see a baseball game besides going to the stadium: at a bar, at home (most of the time, I have LAA-DET on right now), Internet, mobile TV, even radio if that’s your thing. Going to a baseball game is at least a five-hour committment (including the commute), more of you’re going to see NYY, BOS, or both together. That’s a factor, too. Same reason why a box of popcorn costs $8 at the movie theatre. Because [fill in mediocre actor,or Hollywood equivalent of .225 centerfielder] is raking in $14M to make a movie. No, it costs $8 because members of the captive audience are willing to pay $8 for 3 cents (or whatever it is) worth of popcorn. The price of popcorn, or even tickets, doesn’t go down when the theater shows a much less expensive indie film. Nobody, whether they’re putting together a movie cast or a baseball roster, pays exorbitant salaries because they expect to lose money on the deal. They figure that the person they’re paying will make their product more attractive. If the product turns out not to be so attractive because of a bad script or a bad backcourt or what have you, the investor may well lose money, but a producer signs Tom Hanks or the Heat sign LeBron James with confidence that they’ve made a good investment that will return a profit. Its not about financial problems or empty seats or how much players make. Owners want to maximize revenue. If there’s a revenue stream to be had, whether its TV, merchandise, new media, luxury suites, advertising in the stadium, advertising on the jerseys, owners want to tap into that. Put it another way – if there’s a revenue source out there that an owner decides NOT to tap into, they’re consciously leaving money on the table. There a few (not too many) owners willing to do that. Yup, that’s really fixed the WNBA, hasn’t it? Joe S(parma) doesn’t count, I suppose. Does Cleveland Gary count twice? Once for Ohio and once for Indiana? Oh, and Marty Marion too! Reading Paul’s hypothetical situation about the Yankees and Mets swapping full rosters reminded me of a couple of real-life instances where something similar happened. Before the 1984 USFL season, the owners of the Chciago Blitz and Arizona Wranglers swapped franchises. The previous owner of the Blitz moved his operation, all his players, coaches, etc., to Arizona, and the Arizona owner took his staff and went to Chicago. The team names, colors, and logos stayed the same, but the 1983 Arizona Wranglers effectively became the 1984 Chicago Blitz, and vice versa. Additionally, in 1940, in the NFL, the Philadelphia Eagles and Pittsburgh Steelers swapped franchises, at least according to the “discussion” page of the Philadelphia Eagles Wikipedia page (I keep meaning to use the Philadelphia Inquirer archives I have access to to verify this story). According to the writer on the Discussion page, in 1940, Art Rooney sold the Pittsburgh Steelers to Alexis Thompson, who intended to move the franchise to Boston, to replace the Redskins who had departed after the 1936 season. Meanwhile, Rooney purchased “half” of Bert Bell’s Philadelphia Eagles. However, the NFL owners refused to allow Thompson to move the Steelers to Boston. When that happened, Bell-Thompson agreed to move their team – the Eagles – to Pittsburgh and rename them the “Steelers,” while Thompson moved his team – the Steelers – to Philadelphia and renamed them the “Eagles.” Most of the former Pittsburgh Steelers players wound up on the Philadelphia Eagles, and vice versa. One of the stranger consequences of this swap was that, for several years, the Pittsburgh Steelers were owned by an official company called the “Philadelphia Football Club, Inc.” (remember, team names were truly just “nicknames” for legal purposes back in the day). Speaking of ads and marketing on uniforms, revenue etc… I was at the doctors office this morning and picked up a copy of last month’s SI which I had not read ( the one with Serena on the cover ). There was a really good article about the Pittsburgh Pirates…..the writer suggested ( but didn’t directly ) that some small market teams, including the Pirates, actually make turn MORE of a profit by NOT SPENDING MONEY TO FIELD A GOOD TEAM than some of their big market counterparts. Not sure about the numbers, but in a way that seems to maybe make sense. In that case, those teams are treated more like a regular business, rather than civic organization. They care more about the profits than the overall “feeling” of the fans and communities. In that case, they might as well do as they do in Japan and just give the teams corporate names. 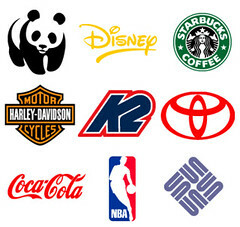 Replace team logos with corporate logos. I am on the fence about this…if this is true…then are the Yankees the “good guys” for spending on the team, less logos etc? too intricate to even begin to discuss here (and not even sure it’s germane to UW) but the one of the problems with something like MLB (or almost any league really) is that bad teams aren’t necessarily “punished” as would a private industry for “poor performance” — but the pirates (or the o’s or any bad team) aren’t kicked out of the league…so there isn’t, in a way, any incentive for an owner to spend money to field a better product…if his team is going to finish in last place with a $50 million payroll, or with a $25 million payroll…why spend the extra bank? The Pirates, who raised some prices every year when they fielded competitive teams in the late ’80s and early ’90s, shifted pricing upward when they moved into PNC Park in 2001. After some success at the gate and 100 losses on the field, they raised prices in 2002, which earned them much derision while losing attendance. With the exception of a couple of tweaks to the ticket map, they haven’t raised prices since. I’m sure that the moment they finally put a winning team on the field, demand and ticket prices will both increase immediately. I should also point out that since the beginning of the amateur draft, the only times that the Yankees won championships were when they could or would outspend other clubs: at the beginning of the free agent era, where it took other teams a couple years to realize they could afford to spend the kind of money on players that Steinbrenner did immediately, and after the Yankees took advantage (legitimately) of the large and competitive New York cable market to get $50 million a year from MSG while many teams were lucky to see $10 million a year. Exactly. There are a bunch of teams in that position. For them its just like a regular business – estimate your revenues for the year, set your payroll based on that, spend that much, what happens on the field happens. There was much to dislike about Steinbrenner but you can’t question that he wanted to win very badly, costs be damned. Lots of owners could learn a lesson from that. And that’s precisely why a salary floor/cap is the best solution for MLB to help improve the sport’s lagging popularity. Agreed, Steinbrenner had a tremendous desire to win, I don’t think anyone outside New York ever doubted that. And the man had a generous heart, to the benefit of many individuals and organizations. Certainly, Yankees fans must consider Steinbrenner the greatest owner in their collective lifetimes, because the money spent played a huge role in the success of the franchise. We have to remember even when teams like the Yankees didn’t win the title, their rosters were still loaded with high price talent, unavailable to other teams. Unfortunately, the history books will also record Steinbrenner helped to usher in the big spending era, and that has been a negative for baseball. It’s been no coincidence the popularity of the game has eroded, just check the TV ratings of the Fall Classic. Most baseball fans wish Steinbrenner had taken the lead of New York Giants owner Wellington Mara, who knew the overall popularity of the NFL was more important, than his own personal goals. Mara was right, and the NFL would take over as the national pastime. The Giants have done well on the field also, and it was a win-win situation. Steinbrenner could have been the same leader he was in the business world-worked with the other owners and players union to install a salary cap/floor back in the day. Also, split up the local TV revenue, for a fair distribution. These acts could have avoided the strikes and made the sport so much stronger. Like the football Giants, the Yankees would have still won titles, and had great players. Gusto I agree with you for the most part. Being that the Yankees and Giants are my 2 favorite teams, I think that both owners did the right thing for their own organizations. The circumstances however were very different. Mara had a choice, he could have kept the TV money for himself, and being that his was the biggest TV market in the country, that would have been very lucrative. He also had the foresight to see that it would be better for the entire league if the TV money could be spread equally. That way no team in the league would have an unfair financial advantage over anyone else. I don’t think many NFL fans realize how crucial a decision this was! But baseball was literally a whole different ballgame. It was never up to Steinbrenner to decided how the league money would be divided. Each team always had its individual TV contract to negotiate. So yes the Yankees have always had the TV advantage and for a few years now have been raking it off of YES Network. When you think about, Steinbrenner actually helped other teams by paying the luxury tax. Teams have POCKETED millions of dollars paid by the Yankees. What the league needed was a clause that stated that funds received from luxury tax sharing must be spent on player salaries, after all, that’s why it was instituted in the first place. So as important as a salary cap is, we can not have one without also implementing a salary BOTTOM! I think that once you have a salary cap, with no bottom, that will be a motivation for perenial low spenders to SPEND EVEN LESS!! Do those two ever work? Here is the short film Logorama that goes along perfect with today’s topic. ‘Logorama is told entirely through the use of more than 2,500 contemporary and historical logos and mascots. The film won the an Academy Award for Best Animated Short Film at the 2010 Academy Awards and the Prix Kodak at the 2009 Cannes Film Festival.’ It’s about 16 mintues long, has a great and hilarious story line. Highly recommend watching. Braves retiring Tom Glavine’s #47 tonight and are using special bases…. Probably due to increasing salaries. That 1956 Marlins jersey was similar to the Florida State League version of the 1980s. The Clearwater Phillies entry wore their red batting practice jersey on occasion in games as an alternate jersey. Those were the days when marketing in the FSL wasn’t what it is today, minor league cities often used the major league nickname. This year Bradenton reentered the league as the Pirates high “A” team, calling themselves the Marauders. Should have mentioned the Clearwater red jersey had “phillies” in lower case across the front of the jersey. I highly doubt the Vikings are having a different-looking “1” this year. The Harvin jersey looks more like a sloppy graphics department job. I know that I’m very late to this but there are a couple of rebuttals I’d like to put out there. You’ve said that you don’t see the engineers or designers on things like cars or furniture, this is a bit of misnomer. We do see these things, quite often actually. Eddie Bauer edition Ford Explorers, Laura Ashley King Koil mattresses, Cindy Crawford Standard furniture, etc. Now, these are not the individual designers, certainly, but rather the company’s that opted to “co-brand” a certain item. Why this works is it puts two known brands together in one item which is what I argue Logo Creep actually is. Teams see more value in a Nike manufactured piece of apparel because the Nike name is more well received than the Spaulding, Wilson, or Sweet Momma Sue’s Stitchery. Why is this? Well, Nike has done a much better job on their own of making a brand that is viewed (by many, not all, as with any matter of opinion) as superior. Aligning a team’s brand with that of a more strongly viewed manufacturer adds to the view of the team brand in the apparel market. At least that’s the theory. Does this mean that it should be this way? Maybe not. But we have evolved into an instant gratification society, the conspicuous nature of logos allows people to instantly garner the quality (perceived?) of an item without having to jump through hoops to do so. Oh, I forgot to add when my issue with “Logo Creep” comes in: When the secondary company (the manufacturer in this case) becomes more important than the primary company. I think this happened with the Pro Combat series from Nike where it was more about what Nike could do than what Texas or TCU or whoever else looked like. Maybe authors of blogs should be anonymous?